Steven Gerrard, England's captain during the latest World Cup in Brazil, has today announced that he is retiring from England football duties. 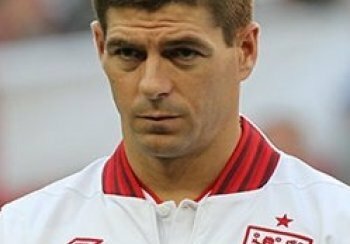 Gerrard, 34, is quitting after winning a substantial 114 caps for the national side, but nothing else of note save for an apparently valuable 5-1 defeat of Germany in 2001. Yeah, I mean, but, yeah. Well, you know, it's erm, you know, it's good for, you know, like. "Aw, yeah, I mean, but yeah, Stevie G was, like, you know, so good for so long. It's going to take some, erm, y'know, sort of getting used to. I guess. Top player, top man. Top loss. Top cat. Top top." Statistic watchers around the world have been reacting to the news with glee, as it has enabled them to come up with more varied and sordid ways of rejigging numbers to create areas of interest. People known to have stolen catchphrases from well known and respected comedians stays the same. Tube-socks per head have reduced by an unknown margin. * But it's a cold day; results may vary. I LOATHE THIS KIND OF POOP, SO JUST ACCEPT THAT I'M RIGHT, DICKS. WEIRD, I TOOK A CRAP LAST NIGHT AND IT LOOKED PRETTY MUCH LIKE THIS.